Beginning in 5th grade St. Mark’s Students are able to participate in the music program by joining the band or orcehstra program or studying piano. Within these programs students learn how to play an instrument, read music, and work with others to create a unique sound. Students perform concerts for their community and compete with other students in the Texas Private School Music Educators Association. 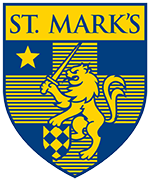 Each year, St. Mark's musicians regularly earn spots in the TPSMEA's All-Region and All-State bands. In addition, students perform for special events, including varsity football games, pep rallies, and special chapel services.